Hello, My name is Debbie. I've been painting since I was very little. Acrylics are my favorite medium, although I go back to others mediums from time to time. 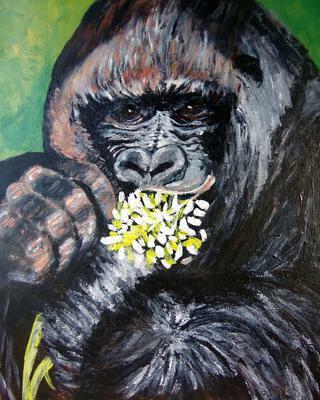 This is a painting of Co Co the Gorilla. He passed away at 44 yrs of age. He was the only Gorilla in the world that could do sign language. I painted along with the "Art Sherpa" online painting tutorial. language. I think he is from Holland. I tried to find a translate button, but there was none. Anyway I wanted to thank him for his comment. I think he said something about it being magical. Is there another way to respond to our comments?